Hi Mike, I did it another way. 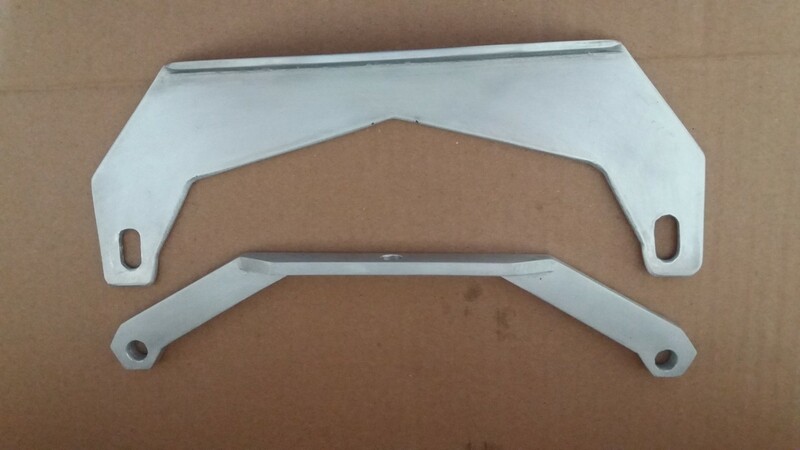 - Place a piece masking tape over an open ended spanner and place the nut into the open end pressing against the tape. 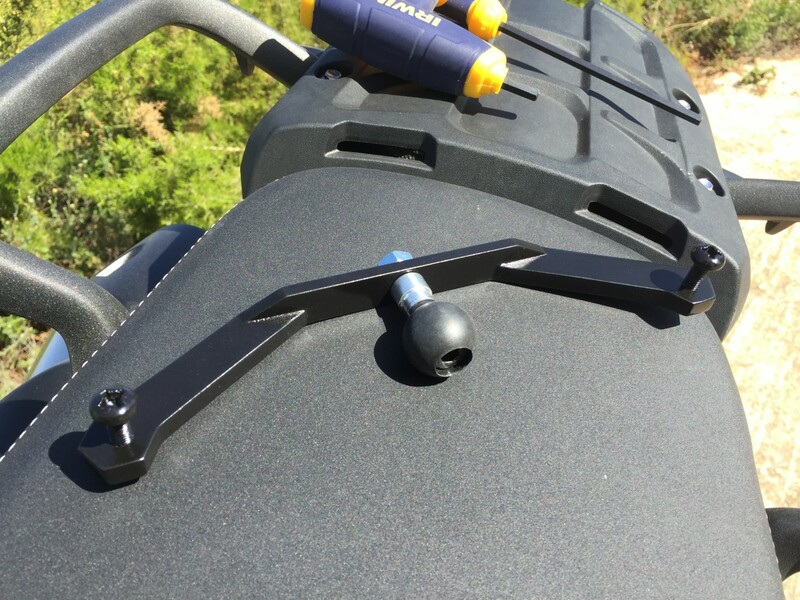 - Align the nut to the hole and screw the bolt through the brackets into the nut. - The nut will push the tape out of the way once it's tightened. I found this easier than taking the screen off but any of the ways is fine and the bracket works really well. Big Thanks to Mike, new bracket arrived and I cleaned it up, drilled the holes and painted it with silk black. While waiting for the cast bracket I had a go at making my own bracket. worked out ok and is sits lower than Mikes bracket which allows the Tom Tom to sit just above the instruments. 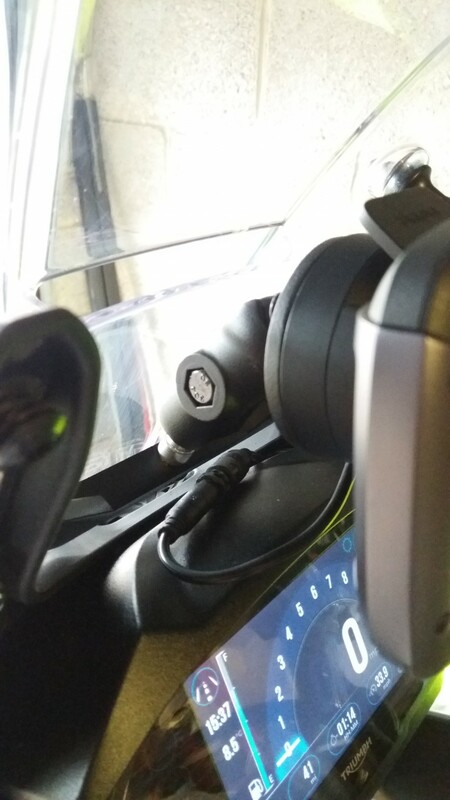 However, Mikes bracket is smaller and higher which allows the Sat Nav to be mounted closer to me, the rider, so I should be able to see it better! I have not had chance to have a ride out yet but I am sure it will work well. Suzuki GP 100, Yamaha DT125, kawasaki Verses, BMW F650GS, BMW F700GS , Yamaha MT09 Tracer and now Tiger 800 XRT. While waiting for the cast bracket I had a go at making my own bracket. worked out ok and is sits lower than Mikes bracket which allows the Tom Tom to sit just above the instruments. 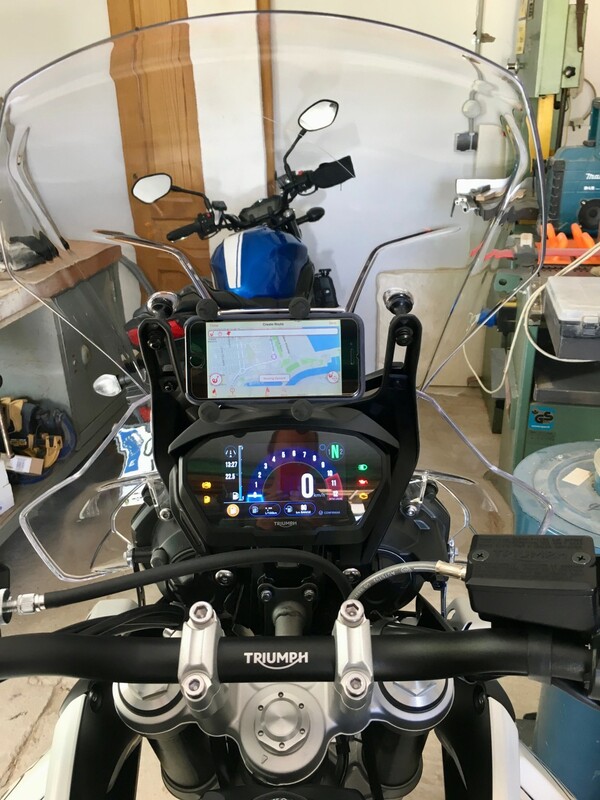 Many riders find it more comfortable to have the instruments and the GPS as near as possible on the same plane so their eyes do not need to refocus so much looking from one to the other. Needing to change focus from the road to the instruments to the GPS and back to the road in quick succession can become difficult and tiring over a long ride. I think you are saying the "over the instruments SatNav position" is the best location for Touring or long distance riding. And from my experimentation I can only agree. 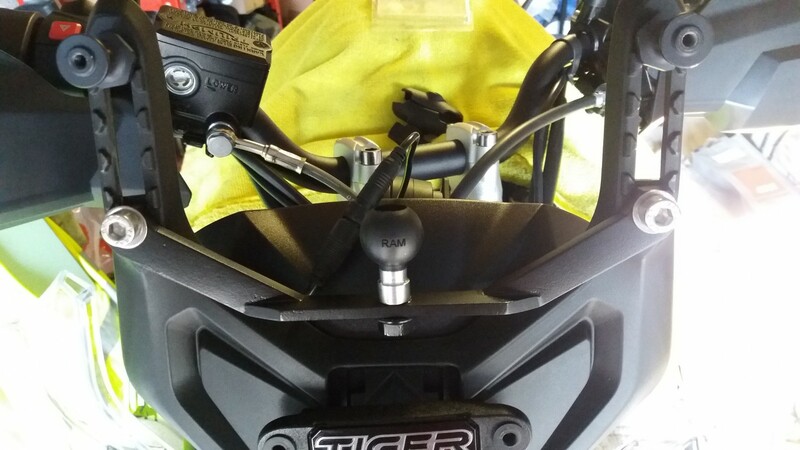 I have had my SatNav on the Tiger in position over the instruments for many months now and my previous bike for many years and find my eye movement is minimised with almost no head movement for a simple glance at the SatNav. 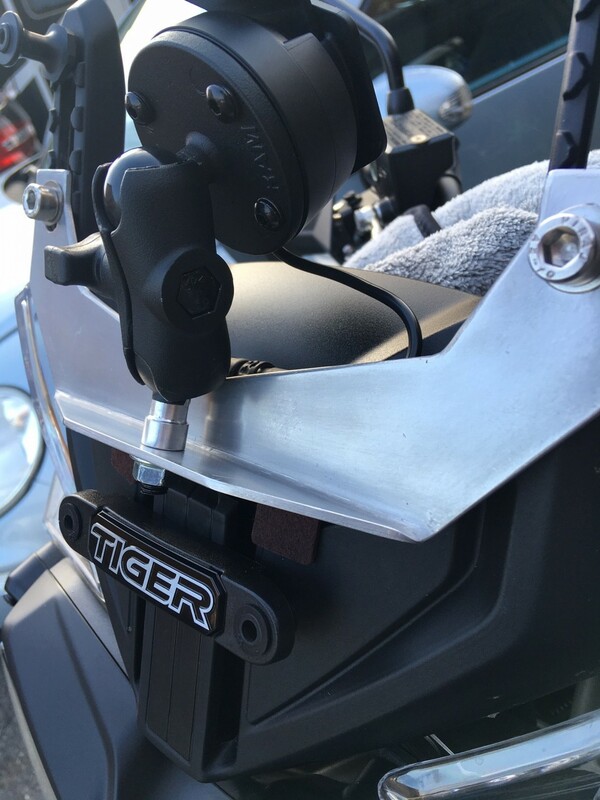 Considering all the different places SatNav can be placed in front of the rider I believe it is safest to put the SatNav as close to the forward view just under the forward visual area required for steering, avoiding obstacles and obstructions as well as Highway Signage. Thus not to obstruct forward view requirements over the Instruments is the most appropriate place for the SatNav. It is always fair for someone to disagree and I am sure if someone knows better I would appreciate being corrected. My information only comes from my years of experience and not science fact. 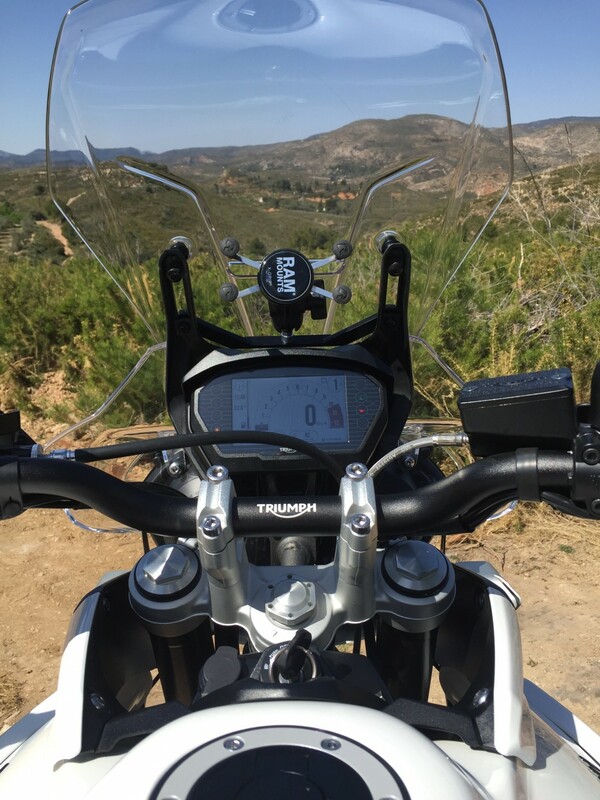 Does our Australian friend have a SatNav fixed to his bike and what is his experience over the long distance that Australia has to offer. Some pictures and text on his experiences I am sure we would all like to see and read. I doubt if I or many others will get to experience the vast Biking opportunities Australia can offer, but would like to dream via someone elses experience. Finally found time to fit my bracket today, very pleased. I copied Sprint (method 2) and tapped the bracket to take M6 bolts. Similarly I cut an M8 thread to take the Ram mount. The bolt was a bit long so I stuck a nut on the bottom to well and truly lock it off. I am currently using my phone and the Scenic app for navigation hence the X-mount arrangement pictured. I'd like to say a big thanks to Mike for sharing his ingenuity with us lot. Also thanks to this forum which makes great things like this possible! Fitting advice if you tap a thread in the SatNav Bracket or use small diameter screw heads or nuts. As there is a lack of plastic to bolt to for the SatNav Bracket it requires a the maximum spread of pressure on what we have available. My suggestions are always to put a large diamenter washer (Penny Washer) if using a small diameter nut or screw against the supplied plastic washer. Use a bit of lubricant (my favourite is Petroleum Jelly) on the back of the nut or screw head, so the metal washer is used like a bearing when tightening. If tightening on the plastic washer without a large metal washer there is a chance the plastic washer may fracture in such a way as the screw or nut will pull through the plastic washer. If you use a large diameter dome flanged screw it is still advisable if it is on the the inside and not against the Bracket as a screw thread has been tapped into the bracket. If using a larger diameter flanged large nut against the plastic washer it is more acceptable not to need a large diameter washer as it is best to turn the screw to tighten and leave the nut stationary. Finally, do not overtighten the screw, not sure how much torque, I turn until i get no movement of the bracket and then tighten a small bit more so it does not come undone. Please do not use all your strength to tighten the screw. If you are not sure always seek advice. Anyone want to add anything or disagree? I have now added a couple of large diameter washers as you suggested. I have actually ordered some larger button head bolts (not here yet) and just used the bolts pictured as I happened to have them knocking around in the garage.